This year the Sujata Vihar, a spacious white building with soft orange stripes highlighting its architectural features, is the site of the medical camp in Bodhgaya, which is sponsored by the Karmapa’s Kagyupa International Monlam Trust. The camp was structured in three phases: two days of visits by doctors and nurses to local villages; a camp at the Sujata Vihar; and three days of care, co-sponsored by the Max Foundation,given by specialist doctors from the prestigious Max Hospital in Delhi. In addition, near the Pavilion at Tergar, four Tibetan doctors served the needs of those attending the Monlam. The main administrative work for the camp was handled by Kunzang Chungyalpa of the Tsurphu Labrang’s Delhi Office and Lama Chodrak, head of the Kagyu Monlam Committee along with Changchup associated with Gangkar Rinpoche in Bir and his assistant, Lhakpa Tsering also from Tsurphu Labrang’s Delhi office. The actual work for the camp began long before it started when a local NGO, Jam Jagran Sansthan, surveyed the local villages and met with their leaders to discuss the camps and create a disease profile of the area. The NGO also facilitated outreach to these locales, letting people know where and when the doctors would be there.Twelve nurses arrived from Delhi and Sikkim while the six physicians came from nearby Magadha Medical College in Gaya, including two senior doctors who are associate professors and four other doctors working under them. The Monlam Trust chose in particular to work with this local NGO and the Magadha doctors, because they know the dialect, habits, and character of the region’s people, who then feel more at ease and welcomed.The village visits were very successful with over eight hundred patients treated. Afterward, the doctors opened their offices at the Sujata Vihar, where long lines snaked around the grounds, first coming to a wide registration table. Here, an individual’s basic information was entered into a form that will be digitized, providing a continuity of care. The next stop was a table with two nurses measuring basic indicators, such as blood pressure, weight, and temperature. The patient then entered one of the three consultation rooms with two doctors and a nurse each. The nurse took a disease history of the patients and their families, checked on their food habits, and made sure all their needs were addressed. After the doctor’s diagnosis and prescription, the people took their script to the pharmacy in a fourth room where medications and nutritional supplements were provided free of charge as well. January third saw the formal opening of a clinic of specialist doctors co-sponsored by the Max India Foundation and the Kagyupa International Monlam Trust. It continued to January fifth and provided specialist care in gynaecology, dermatology, pediatrics, and internal medicine–the four areas of greatest need according to the earlier survey. Auguring an auspicious start to the New Year of 2015, the opening event was attended by His Holiness the 17th Karmapa Ogyen Trinley Dorje, Mr. Khandelwal, the Commissioner of Magadh District, and Ms. Mohini Daljeet Singh, CEO, Max India Foundation. In her talk, Ms. Singh mentioned how delighted Max Foundation was to be working with the Gyalwang Karmapa and how hopeful she was that this collaboration would continue. She quoted the motto of the Foundation that encapsulates their sense of corporate social responsibility and the need to give back to society: “The opportunity to serve is grace. Making a difference in someone’s life is our humble duty.” Speaking to an issue dear to the Gyalwang Karmapa’s heart, she also mentioned that as an extension of its work in health care, the Max Foundation is interested in the environment as a healthy environment promotes well-being. Ms. Singh closed with the hope that the future would bring more camps and greater cooperation between Max Foundation and the Karmapa’s trust. 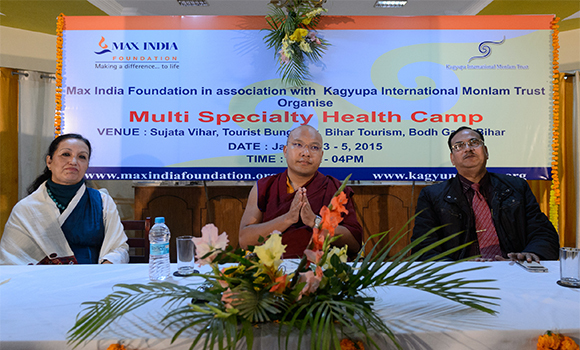 The Gyalwang Karmapa then spoke, saying that he was very happy to be partnering with Max Foundation to offer free health care in Bodhgaya—the most important place for Buddhists as it is the source of wisdom in the world, the place of the Buddha’s enlightenment. He noted that there are many Tibetan Buddhist prayer festivals in Bodhgaya, and it is important to give back to the people here who have been so helpful. In the future, he looked forward to working together with Max Foundation to give medical care to those in need. Mr. Khandelwal, the Commissioner of Magadh District, also briefly addressed the meeting, giving his appreciation to the Max Foundation and the Karmapa for their good works, promising to give whatever administrative support they might need. After this meeting, the Karmapa walked across the road to The Akong Tulku Rinpoche Memorial Soup Kitchen, which provided hot meals to the people coming for medical care. When the doctors were out in the village, the soup kitchen gave fruit and juice to all the patients. The proximity of the soup kitchen and the medical camp underscored the connection between health and nutrition, one which the dermatologist, Dr. Nitin S. Walia, was also emphasizing to his patients. He mentioned that during these camps, it was possible to cure many of the skin infections, as they simply required the proper diagnosis and medication, plus education on hygiene and nutrition.If there are more serious cases, the Max Foundation is prepared to take these people to Delhi for treatment. In the three days of the camp, the five doctors treated more than two thousand patients. Concurrent with these medical camps was the Tibetan medical service provided in three bright blue tents near the Pavilion from December 18 to January 5. One tent housed long tables of free Tibetan medicine, its herbal aromas filling the area. The two other tents were the offices of four Tibetan doctors, who alternated their times: Dr. Dawa, who is also a painter assisting the Karmapa in setting up the stage, Dr. Namgyal Qusar and his wife, Dr. Kalchou, and another woman doctor, Dr. Tseyang. Dr. Qusar has a medical center near Norbulinka, in the Dharamsala area where he treats patients with medicine he makes. Originally from Tibet, Dr. Tseyang works at the Bir Hospital, a branch of the Dharamsala Government Medical Hospital. Knowing that she wanted to help children and the handicapped and that it would be difficult as a Tibetan to study medicine in Tibet, at the young age of thirteen, she made the dangerous journey from Tibet over the Himalayas into India to study at the Suja School. (The Karmapa has a close connection with this school as it was the first one he visited after leaving Tibet, and all the Dharmapalas serving as guards during the Monlam come from here.) After the Suja School, Dr. Tseyang continued her studies in Bylakuppe, Sarah School, and finally, she spent six years at the Tibetan Medical Hospital in Dharamsala. Asked for an overview of the camp, she commented that her patients were mostly suffering from temporary illnesses, such as colds and intestinal problems, but they also had longer term sicknesses, such as arthritis and high blood pressure, both of which are especially benefitted by Tibetan medicine. In reflecting on all the medical care and the caring people who provided it, one can see that the motivation to benefit others, to lighten their suffering, and give them a chance for a healthier life has been shared by all. This universal impulse—rising from our basic goodness and residing in the hearts of all people and all true spiritual paths—was clearly evident during these special days of medical care.